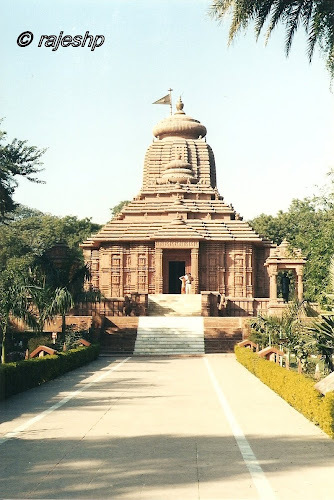 Actually we started the sight seeing at Gwalior by first visiting this temple and then moved on to see the heritage sites in and around the city. It is located 5 kms from city center. This is a very new temple and was constructed in 1988. 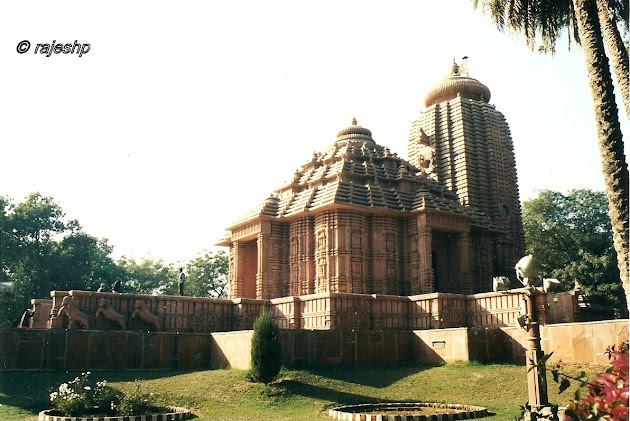 It is inspired by architecture of the famous Konark Temple in Orissa. The exterior of temple uses red stone while the interior uses white marble. There is a beautiful sculpture of Lord Surya in the temple. 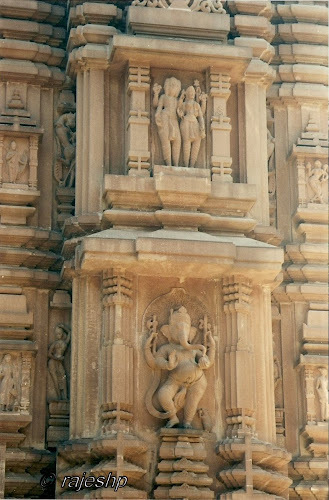 The carvings on the exterior of the temple depict various Hindu Gods and they have been carved beautifully. Even though this temple is pretty new it attracts lot of visitors. The temple premises has a beautiful garden and is a nice place to relax. I feel that it has some similarities with Konark temple. Its beautiful, esp considering its so new... usually, i dont really like the kind of work in newer temples, but this is great! What a spectacular edifice! Brilliantly captured! Very nice for a new temple. I hope they maintain it well too. Nice knowing about this quite neat temple. Good pictures rajesh! I hope that all these beautiful temples will be preserved for the future generations en never destroyed by religious fanatics. Thank you for your visit! You said I gave you a little insight in my life. Well in the sidebar my whole life is described from my birth to this time. I also mentioned the time that I was a prisoner in a Japanese concentration camp. I have written about it last year. I wrote about my life on 24th March 2009. I also made a slide about my life. Such beautiful, intricate carvings. I like the horses at the side of the steps. wow!! the cravings are so fine and amazing till now!! wonderful temple. I love seeing this! A magnificent temple! Thanks for the beautiful pictures! another precious temple. i don't think one day is enough to explore and photograph this temple. Gorgeous shots of a gorgeous temple! Such a great post, Rajesh, as always! Love the information that you include! Have a great weekend! Such beautiful sights and pictures. It is so beautiful.I love the beautiful carvings. Thanks for sharing. Your images are absolutely Amazing! Such Masterpieces of carvings on the buildings...Simply put.."Awesome". Rajesh: Neat shot of the sky over the temple. Such a beautiful temple and it looks like very peaceful! I'm always amazed at the beautiful temples you show us! such beautiful place and the carvings are really amazing. Great captures! Happy skywatching! Beautiful temples and photos! Great post! Very nice job on capturing so many details on those temples. Great job. Thanks to you I was able to see another wonderful place. great capture. Good shots. I have visited this temple about 2 years back, and recall it is a beautiful temple. You really are blessed with some beautiful temples. Wow - look at those carvings. Amazing! So well constructed with beautiful sculptures. Wonderful photos with a very informative write up.The carvings are beautiful. When I saw this temple I thought it was one of the ancient one. It is great that the craft work and building skills does not get lost by constructing these beautiful temples which belong in this ancient land with all its traditions. Wonderful as always, Rajesh. Thank you for stopping by and leaving a comment. Love the dramatic details in this temple! Beautiful series of photos! You have so many beautiful temples in your part of the world. Beautiful shots. It is nice to see such beauty rendered in our time, too! Fabulous architecture and amazing piece of history. 1988? I would have guessed much differently...that it was much older. It must be something to see in person with that red stone and white marble! Lovely...take me back to another time. I love the Sun Temples everywhere!!! This one is new to me - Thanks for the new info about a new temple!!! Amazing place. Your wonderful photos always make me wish I could visit your country. Namaste! Because you like arts, you will like this: : STAR!! Deepak: Thanks. This is designed based on the Konark Sun Temple. Kirigalpoththa, Bhavesh, Anya, Vaggelis, Zuzana, Rakesh, Wil, Janice, Swetha, Tarun, Lee, amatamari, Photo: Thanks for the appreciation. Greener, Titania, Sandy, Songbird: Thanks. Very true we still have artists who have the skills. Kcalpesh, Rafael, Sylvia, Spiderdama, Riet, Eden, webruci, Eaglebrother, noel, Guy, Bar, Kim, Carletta, Marites: Thanks for the appreciation. Anu: Thanks. Even I do not appreciate the newer temples. But this one iscertainly different. eileeninmd, Samson, LV, Vernz, Sarah, Regina, LadyFi, Indrani, Joseph, Shubd, Pam, Gemma, Carver, Anna, Pearl: Thanks for the appreciation. Celine: Thanks. I had visited this temple a year back. Jeevan, Jacob, Shelle, Laura, Bhushavali, fufu: Thanks for the appreciation. MyMaracas: Thanks, You are most welecome to see them in person. Shooting Star: Thanks. This is designed based on the Konark Sun Temple. Radha: Thanks. It is maintained very well. Babli: Thank you. Happy Holi. Wonderful idea to feature red stone in Ruby Tuesday! It does look like a nice place for relaxing. Beautiful ... I love those ornate carvings..
Rebecca, Karen, Kathy, Marice: Thanks for the appreciation.